Stroke Correction By Yourself | Mediterra - Swim & Run Better Than Ever! How do I make a stroke correction by myself when there is no coach to tell me if I am doing it right or wrong? It is a good concern, but I think there is an obstacle to grasping the answer because swim training is commonly viewed in misleading context. There is a difference between a right-or-wrong position/movement and something that is better-or-worse than it was before. Your swimming skill, for the most part, is not a right-or-wrong situation. Its on a continuum from ‘No Control’ over stroke and pace to ‘Complete Control’ over stroke and pace. Behind you, behind your current abilities you see that state of No Control, and then in front of your somewhere close or far away you see that state of Complete Control in some idealized swimmer’s video, realizing various parts of your skill are nowhere close to that ideal. But your are committed to moving yourself forward on that continuum day by day, month by month, year by year. When you are practicing with mindfulness you will be a better swimmer today than you were yesterday. 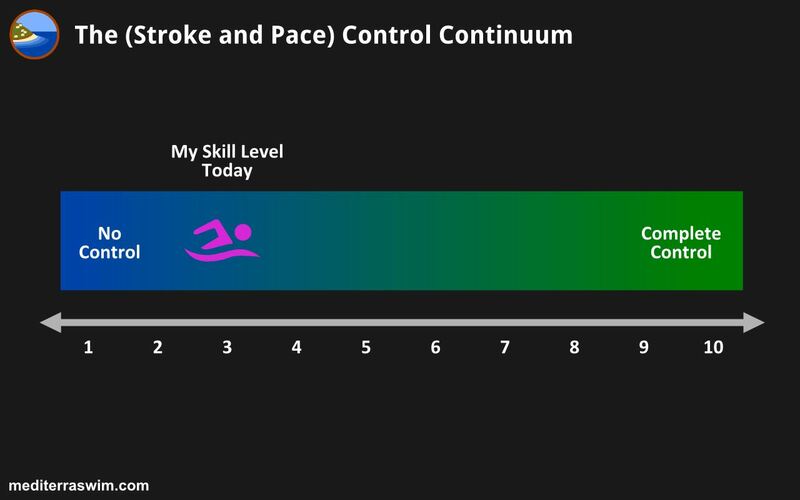 The key to moving along this continuum is to learn the context, mindset, and skills for making stroke correction by yourself. I propose that this is the wrong question. You will do well in your planning and self-evaluation when you put your swimming practice in context, and use other learning situations as reference points for expectations on progress. For example: How do you learn a language? How do you learn an instrument? How do you learn tennis? Do you refuse to converse because, at first, you pronounce the foreign words with an stutter or accent? Do you refrain from performing in front of others because you can’t play the piece as smoothly as a concert pianist? Do you fear playing tennis with friends with less than a Wimbledon-like swing? Will your use of skill at your current level lock you down into ‘bad habits’ you can’t change later? No, you challenge yourself to make an improvement in some area and then you get out there and enjoy using it. By mindful use, your sensitivity and control increase, then you go back after a while and make another improvements. Improve – enjoy. Improve – enjoy. You know that improvement comes in stages, bit by bit, over time. The fact that some part of your language/music/tennis skill today is still less than ideal is no threat to your enjoyment of it today and your improvement upon it tomorrow. Bad habits that are hard to break are formed by mindLESS use. New habits that are formed in mindFUL use can be dismantled more easily and rebuilt into new ones by the same process. 1) wrong = any movement pattern that is injurious. 2) wrong = wasting energy = using more energy more than I need to get the work done. For #1 a conscientious swimmer or coach will address this immediately. In this you should NEVER practice a ‘wrong’ (=injurious) movement pattern. For that you should stop and seek professional correction as soon as possible. The fundamental Total Immersion swimming skills are specifically intended to remove the risky position and movement patterns from your body and stroke. That’s why we start at the spine alignment, set that up first, then work our way out to the appendages so every part of the body is set up to work smoothly together. Many swimming injuries are caused because the body is working against itself and against natural forces (unnecessarily). Those are the first things we correct with TI. For #2 you will embark on a journey lasting your entire lifetime as you learn to perform every movement with less energy demand and spend that saved energy in more pleasing ways (swimming smoother, farther, faster!). Your goal for today is to simply practice swimming a bit more efficiently than you were yesterday. Worse = moving in a way that is less efficient than I am capable of. Better = moving in a way that is smoother, faster with less effort than it was yesterday. Your evaluation of whether it is ‘better or worse’ today than yesterday can be supported by external measurement (= what the coach sees, what data the SPL, Tempo, Time, etc. offer) but alone can’t prove it. Ultimately, you will use external/objective measurements to help you learn to read and trust what you feel inside. In swimming you can’t easily measure energy-expense (like you would measure temperature), so you’ve got to learn how to feel it. An example: You just achieved a stroke that resulted in lowering your SPL N-1 point from yesterday’s SPL N. But how did it feel? Was it as easy or easier to achieve N-1 as it was to do N? If not, you may have made a longer stroke, but you may not have made it in a more efficient (=using energy better) way. Repetition and testing is required to see how you can truly declare N-1 a better result than N, in terms of efficiency. Paying attention to external appearance of the stroke (asking the coach to tell you if it looks ‘correct’) is useful but incomplete information. I recommend that you take every comment about how you look on the outside and pair it with your own internal sensations of what it felt like – so that you can recognize what is more effective for sending your forward with less effort. 1) Your goal right now is to do the movement better than you were doing it previously. You use the ideal image or example to help you decide on a change to aim for, then you use ‘yesterday’s habit’ as a reference point for your progress today. 2) In every mindful practice you are increasing your ability to make self-improvements more easily. As important, if not more so, than making the movement itself better, you are practicing the skill for making changes to your own stroke. If you can change it once, you can do it again. And the more you do it, the easier it will be to detect and correct deficiencies in your own stroke. Let’s say you are starting at Skill Level 1 (with Level 10 being Complete Mastery) and working towards Level 2. In your first time through the process your learning may be slow and confused (because there is so much new information), and you may be frustratingly aware that you are still nowhere close to Level 10, and wonder how you will ever make it there at this sea-snail learning pace. But what you need to realize is that you are getting better at the learning process every time you go through it, every time you challenge yourself to mindfully work to the next level of skill. You will gain ‘learning momentum’ and find yourself more competent and more confident about the process of improvement each time. The experience will get better, from Level 1 to 2, then from 2 to 3, then from 3 to 4, and so on. But if you set up the expectation that there is only Level 1 and Level 10, and you must somehow jump from 1 to 10 or else you are ‘doing it wrong’ this is not going to work well. Your skill in swimming steps up one level at a time, AND your skill for self-correcting your own stroke goes up with it. It will become easier as you practice the skills for changing yourself. So, you may have a long way to go to reach your ideal in swimming, but you should notice an increase in your ability to detect and change old habits. So, you don’t need to fear making a new ‘bad habit’ that you will have to correct later on. This is a misleading way of describing what you are doing in your swim practice. You are making some part of your stroke better than it was before. You are making an improvement from yesterday to today. And tomorrow, you will make an improvement from today. However, this is COMPLETELY DEPENDENT on a mindful approach to swimming. Mindfulness in your swimming = Improvement in your abilities to make stroke correction on your own. So, when you train the brain in mindfulness, improvements in your body will follow more easily.